From their origins as medicinal products, bitters became an integral part of the Golden Age of cocktails, providing drinks with flavor, depth and complexity. Prohibition devastated the bitters industry; only a few brands survived and many disappeared, never to return. Thanks to the ongoing cocktail renaissance, bitters have clawed their way from the brink and back to their rightful place in the global spotlight. Among those leading the way is The Bitter Truth, an award-winning German company founded in 2006 by Munich bartenders Stephan Berg and Alexander Hauck. When Berg and Hauck decided to embark on their new venture, the duo had already garnered invaluable experience creating housemade bitters for their respective bars, a response to the difficulties of sourcing quality bitters in Germany. The Bitter Truth would benefit from Berg’s extensive knowledge of various bitters flavor profiles, insight that was gleaned from his world-class bitters collection, which includes many extinct brands and rare bottles. Berg and Hauck would base their choice of bitters releases on classic cocktail recipes that were incomplete because the proper bitters – the vital ingredient – was no longer available. 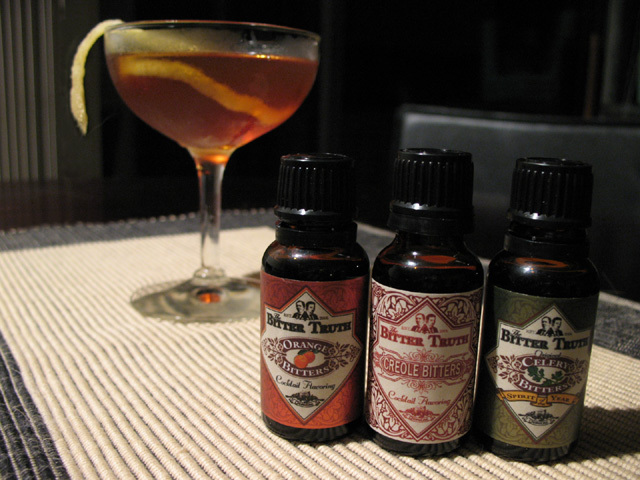 In August 2006, The Bitter Truth debuted its first two releases: Orange Bitters and Old Time Aromatic Bitters. Subsequent releases include Lemon Bitters, Jerry Thomas’ Own Decanter Bitters, and Celery Bitters. The newest in the range is the excellent Creole Bitters, which will be available stateside in the near future. The Bitter Truth has also expanded its offerings to include SloeBerry BlueGin, ELIXIER, and other fine liqueurs. The Bitter Truth recently sent me their latest creation, the delightful Cocktail Bitters Traveler’s Set. This handy kit contains five different bitters in convenient 20ml travel-size bottles, packaged in a box that looks like it came straight out of the Jet Age. 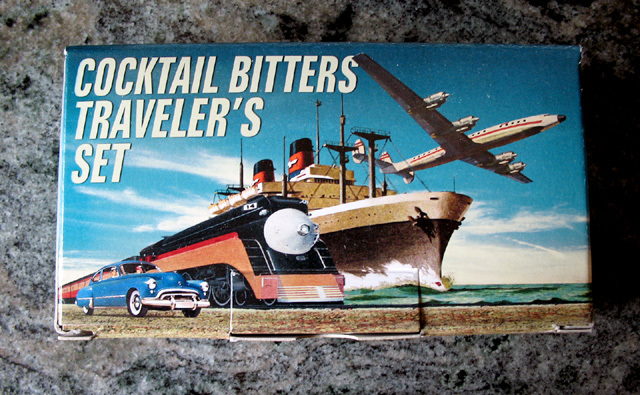 Plane, train and automobile. And ship. On the front we have our intrepid traveler, luggage (and bitters) in hand. The back is a dramatic image of transportation in action. You can practically hear the Bernard Herrmann score. 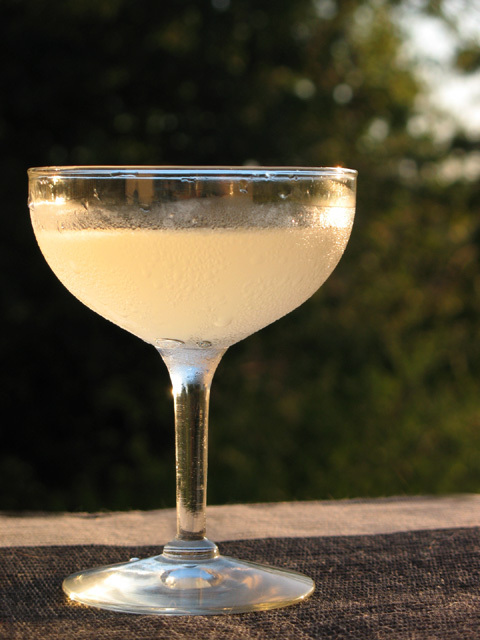 Celery Bitters – Very complex and exotic. The initial flavor of celery is dominant, leading into a complex palate with aromas of lemongrass, orange peel and ginger. Old Time Aromatic Bitters – Classically bitter and tangy. Combining the aromatics of cinnamon, cardamom, anise and cloves, it reminds one of gingerbread. Orange Bitters – The aroma of bitter orange peel is in the foreground, complimented by the spicy flavors of cardamom, caraway and nutmeg. Creole Bitters – The complex combination of flavors hints upon spice, bitterness and cardamon with a subtle floral finish that evokes the flavors of Creole cuisine in New Orleans/Louisiana. Bittermens Xocolatl Mole Bitters – Deep chocolate notes are supported by classic bitter flavors and accented with a hint of spice. Plays perfectly with most dark spirits, rums and tequilas. For more information, visit the-bitter-truth.com. In the second volume of The Gentleman’s Companion (aka Jigger, Beaker, and Glass), Charles H. Baker Jr. includes a recipe for The Fourth Regiment Cocktail, Brought to Our Amazed Attention by One Commander Livesey, in Command of One of His Majesty’s Dapper Little Sloops of War, out in Bombay, A.D. 1931. He describes it as “a Manhattan Cocktail made in 4 oz size, spiced with 1 dash each of celery, Angostura and orange bitters.” Robert Hess sources a recipe that’s even older, one that uses Peychaud’s instead of Angostura. 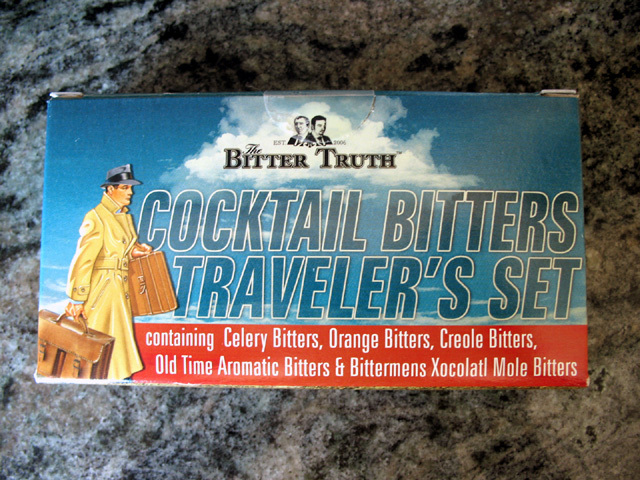 With this recipe in mind, three of the flavors from The Bitter Truth Traveler’s Set are featured in the Fourth Regiment Cocktail. It’s a wonderfully flavorful and aromatic drink, resurrected from history thanks to The Bitter Truth. Fourth Regiment Cocktail and The Bitter Truth trio.